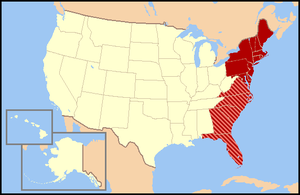 The states colored in dark red are always thought of as the East Coast. All parts that have stripes are sometimes not thought of as the East Coast. The East Coast of the United States, is a part of the United States. It is also called the "Eastern Seaboard" or "Atlantic Seaboard". The East Coast refers, or talks about, the farthest east states of the US. These states touch the Atlantic Ocean all the way up to Canada. Sometimes people use it to mean only the Northeastern United States. Other times they mean the thirteen original states plus Maine, Washington, D.C. and Florida. The southern half of this region is in the Southern United States or Southeastern United States. This page was last changed on 17 November 2016, at 18:30.